I am wrapping up Mastering Copperplate Calligraphy. It is difficult to pick a few sentences to highlight chapters 8,9, and 10. Chapter 8: Writing Out a Page, Chapter 9: Commercial Calligraphy and Chapter 10: Retouching, Correcting and Cropping emphasize the importance of layout, considering colors, considering margins, practice, developing a reliable copperplate, and wabi-sabi (the acceptance of transience and imperfection). I picked up invaluable information from this book. In Letting in the Whimsical Woodlands, I moved on to the basic strokes for brush pen calligraphy. I will trace out the Burrow and Flutter alphabets next, then it's on to drawing/illustration. 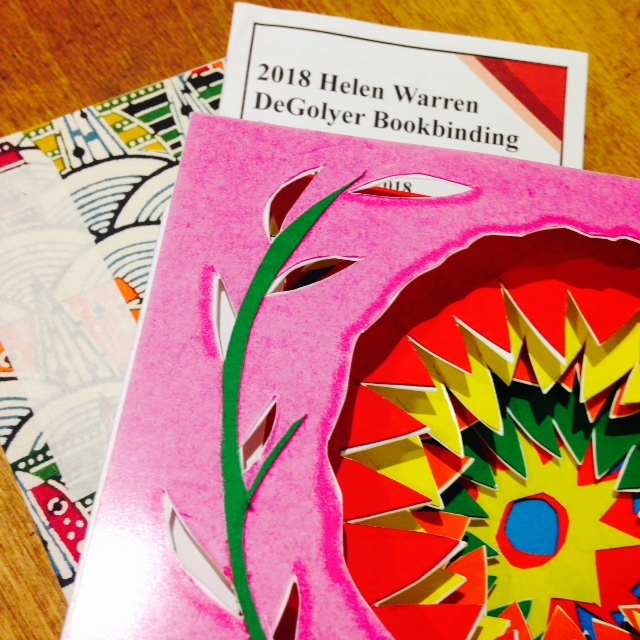 Last, week I attended the Helen Warren DeGolyer Bookbinding Conference with the Book Doctor crew. It was an enriching experience. I took two workshops: Tunnel Book with Maria Pisano and Japanese Stab Binding with Bexx Caswell-Olson. Both were super fun and informative. This Saturday at the Tally Dunn Gallery at 6:30p, Cynthia Mulcahy: War Garden. I have had a wonderful time contributing to this beautifully rich body of work over this past couple of years. It helped me grow as a calligrapher, friend, US citizen, etc.